Looking for a thrill? Try Hamilton to Brantford bus tours — it’s just a half hour from Hamilton with endless possibilities at OLG Casino Brantford! Try your hand at 55 table games including Stud Poker, Blackjack, Roulette, Texas Hold’em and more. Betting limits range from a minimum of $5 to a max of $10. Guests can also explore some of their upcoming poker tournaments. Over 500 slot machines add to the adrenaline rush — your only dilemma is which one to try first! Enjoy sumptuous dining at the Getaway Restaurant, full-serviced for breakfast, lunch and dinner and until midnight on Fridays and Saturdays. Take advantage of other amenities such as complimentary non-alcoholic beverages, currency exchange stations, a gift shop and complimentary coat check. Ontario to Brantford coach bus tours let you relax and take a stroll around Brantford to calm the adrenaline. Discover the Canadian Military Heritage museum or the Bell Homestead National Historic Site. Brantford is often referred to as The Telephone City, as Alexander Graham Bell, a former city resident, invented the telephone at his father’s home, the Bell Homestead, and conducted the first long distance telephone call from Brantford to Paris, Ontario in 1876. As if that doesn’t leave guests thoroughly star-struck, Brantford is also the birthplace of legendary hockey player Wayne Gretzky, comedian Phil Hartman and Group of Seven member Lawren Harris. Don’t stress over transportation — Can-Ar Coach offers a range of Brantford Ontario bus schedule services. The Brantford casino bus features opulent facilities that make the trip comfortable and convenient. 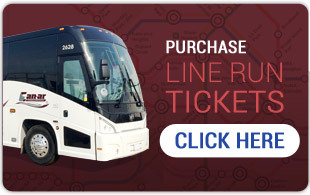 Bus from Brantford to Toronto by Can-Ar Coach is available at unbeatable prices!